We just got a press release about one of our favorite web series "Chad Vader: Day Shift Manager." The humor of these videos comes from Chad's perfect mix of ego and incompetence. If you've never seen or heard of him, head over to Babelgum to watch it. BABELGUM ACQUIRES ENTIRE LIBRARY PLUS ORIGINAL EXCLUSIVE EPISODES OF HIT COMEDY SERIES "CHAD VADER"
LONDON / NEW YORK (June 24, 2010) - Independent web and mobile video content platform Babelgum announced that it has acquired the complete library of Blame Society Productions' original, hit comedy series' "Chad Vader." Producers and directors Aaron Yonda and Matt Sloan will also be creating exclusive original episodes to air monthly on Babelgum's Comedy channel starting today. "We are very excited to add 'Chad Vader' to our Comedy library. The series itself has been an internet phenomenon, receiving more than 80 million views. Now it can continue to grow through our vast global network of rabid comedy and sci-fi fans," said Amber J. Lawson, Publisher of Babelgum's Comedy channel. "We look forward to supporting Blame Society Productions as they continue to create hysterical new content that will evolve the show's brand. "The fan response to 'Chad Vader' has been amazing and we're happy to be working with Babelgum to be able to reach an even wider audience," said Aaron Yonda. Matt Sloan added, "This partnership is giving us a great opportunity to expand the world of Chad Vader and create some exclusive new content that you can't find anywhere else." 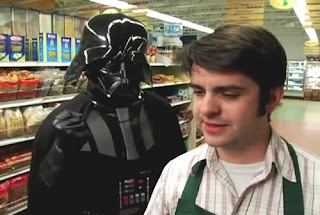 "Chad Vader" features the adventures of Darth Vader's younger brother and his comedic struggles as the Day Shift manager at the Empire Market grocery store. He clashes with customers, tries to earn the respect of his employees, and occasionally incorporates dialogue and concepts from the historic franchise. Since it was first created in 2006, "Chad Vader" has become a viral sensation, quickly becoming one of the most viewed series on YouTube. In addition it has won more than a dozen film festival awards, including the "George Lucas Selects" award from the 2007 Star Wars Fan Movie Challenge. It has gained huge popularity from a global audience and was translated into 6 languages, including Portuguese, Spanish, French, Chinese, Hebrew and Lingua Franca Nova.Both Yonda and Sloan also appear in the series as the lead characters. Sloan provides the voice of Chad Vader, which led to other voiceover roles, including providing the voice of Darth Vader in the LucasArts' videogame "The Force Unleashed." In addition to "Chad Vader," Blame Society Productions will also be rolling out episodes of the show "Celebrity Bric-A Brac" on Babelgum. Starting June 24, viewers can begin watching "Chad Vader" on www.babelgum.com/chadvader. "Chad Vader" will release an exclusive episode each month on Babelgum. Start with Chad Vader 1.1 "A Galaxy Not So Far Away" and then hit up Chad Vader Sings "Chocolate Rain." If you don't laugh watching Darth Vader singing "Chocolate Rain" then there's no hope. Coming soon, we'll have an exclusive interview. So, come back later this week to find out more about "Chad Vader: Day Shift Manager." Have you watched Chad Vader before? Are you looking forward to the new episodes?